Review Summary: On the whole MERE YAAR KI SHAADI HAI is a decent entertainer that should appeal more to the city audience. On the whole MERE YAAR KI SHAADI HAI is a decent entertainer that should appeal more to the city audience. Recycling seems to be the sacred mantra of the Karan Johars, Subhash Ghais and Yash Chopras. Care for a remix version of Mira Nair's Monsoon Wedding? 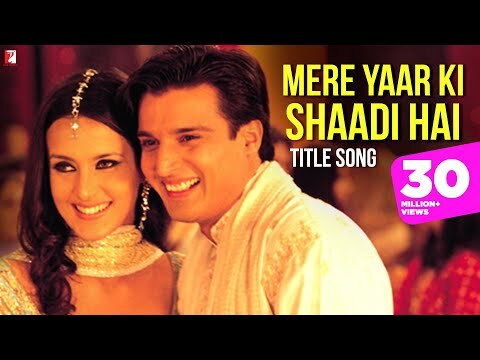 Yash Raj Films Mere Yaar Ki Shaadi Hai is just that and brings a wedding with the onset of monsoon in India -- replete with songs dances and marriage parties. Mere Yaar Ki Shaadi Hai, if loosely translated would be ‘my best friends wedding’ -- which is exactly where this film takes inspiration from. Producer Yash Chopra’s gift to his younger son, Mere Yaar Ki Shaadi Hai, is a straight lift from the Hollywood hit, My Best Friends Wedding.